As we celebrate American Independence, it is important to know what it means and what it doesn’t mean. It is important to know what to fight for and what to fight against. After 236 years of American Independence, we are once again in a fight for the survival of the United States. While militant Islam is a grave threat from without, an even graver enemy from within is threatening to destroy the United States. That enemy is Communism, Socialism, Progressivism. 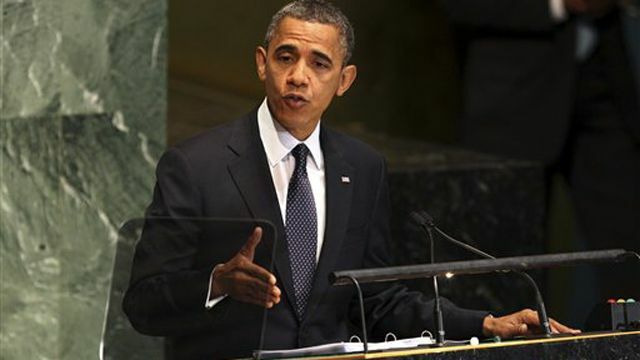 Obama: The future must not belong to those who slander Islam. Islam: If you are a Christian or Jew, your very life slanders Islam. If you are atheist, you also slander Islam by simply being atheist. Me: The future must not belong to those who support genocidal anti-Christian anti-Semites. Nile Gardiner, The Foundry: Obama Has Another Jimmy Carter Moment at the U.N.
President Obama’s U.N. speech offered little confidence for those living in the direct firing line of an Iran, which may soon be armed with a nuclear weapon.For the people of Israel—and millions living in the Gulf states that lie in the shadow of Tehran—Obama’s address to the U.N. must have looked positively Carter-eqsue in tone and spirit. This was a milquetoast statement on Iran by the U.S. President, who projected a dangerous leading-from-behind mentality at a time when the free world needs bold U.S. leadership. Neck And Neck In Ohio? Ohio is a true bellwether state, with a very long trend of voting for the guy that eventually is declared the winner in Presidential elections. You will likely never see a D+5 or R+5 D/R/I electorate in Ohio, as the state trends a much narrower +/-2 with a strong Independent voice generally speaking. If you see a poll that declares Obama leads by 8 in Ohio, for instance, you can throw that poll in the garbage bin. That sort of outcome will never happen in Ohio. So, there’s this new poll that Nice Deb found, showing a neck-and-neck race with Obama ahead 45.2 to 44.3 (and always remember when an incumbent cannot reach 50 percent, especially this late in the season, that incumbent is in trouble). Sounds about right for bellwether Ohio in a tight election year, no? But there’s more to that poll. Nice Deb points out the heavy skewing of the poll itself. The D/R/I gives Democrats a +10.3 advantage in bellwether Ohio to arrive at a +0.9 for Obama. Nice Deb asks why the completely out of touch with reality Democrat skew for the poll. That’s a very good question. But I have a different observation. In order for the poll to give Obama a +0.9, it had to skew in favor of Democrats by +10.3. The polling firm had to give a huge, unrealistic Leftward advantage just to get Obama up to a tie with Romney/Ryan in bellwether Ohio. That means, Romney/Ryan pretty much have Ohio in the bag. And, as I pointed out, Ohio has a very long track record of voting for the winner, thus, Romney/Ryan will win in November. Oh, as an aside, after the media-spun “very bad week” for Romney, Gallup moved him from -5 to even. Another “very bad week” for Romney and he might be +5. Posted in Elections, media, Obama, politics | Tagged: 2012 Presidential Election, Barack Hussein Obama, Mitt Romney, Ohio Presidential polling, Paul Ryan, skewed polling | Comments Off on Neck And Neck In Ohio? Candace Cameron-Bure is a beautiful woman, inside and out. I posted photos of her this year, alluding to one of the Holiest days of the year. That article will most likely be the most viewed article on this site this year, despite this being a political blog and this year being one of the most important political years in many decades. It was the case before the last couple days. It is much more the case now, as the last couple days added 1,000 views. So people are very much interested in her beauty. But it’s her mind that is the most beautiful thing about her. She gave a Convocation address at Liberty University, which then posted it on YouTube in January of this year. In it, she discussed her own life and journey to living a true Christian life. She discussed how being a “good person” simply wasn’t good enough, and that she was herself in danger of Hell, but is no longer. She’s a very good role model, someone to be looked up to and emulated as she shines the light on the One True God, coming out of a city and industry that promotes hedonistic libertine lifestyles. Shane made an excellent comment on my Candace photo article. “She has certainly aged with grace…I think what makes her so hot is what she doesn’t do….no r rated flops on her resume.” The reason why she doesn’t have any R-rated flops on her resume is because she refuses to do them. No movies glorifying immorality for her. She shared a passage from Scripture which convicted her. 1 Corinthians chapter 6, verses 9 and 10. It is because of that and other information she learned that she quit being a “good person” and chose to live a life of Christ. And she won’t be swayed by the Democrat war on women or by Democrats (even elected Democrat women) calling her not a woman, due to her righteous, God-fearing life. Yes, Candace Helaine Cameron-Bure has a very beautiful mind. And that’s what’s most important. Mitt Romney told the truth! The Democrats are pushing this meme, as though it’s somehow a bad thing. Well, yup, he said it, and he told the absolute truth! He won’t ever convince the welfare malingerers and those dependent on government that they should take personal responsibility and care for their lives. He won’t ever persuade a 30 year old college student, one able to afford an expensive private school like Georgetown University, that she should be expected to buy her own birth control pills, and not depend on someone else to do it for her. He will never persuade those people who think that other people somehow owe them a living that they should take care of themselves. He will never convince the occupiers and the fleabaggers that they are responsible for their own lives and own success, and that they need to grow the [insert slang term for fornicate here] up. And this is why the TEA Party exists, this is why so many working class people will vote Republican. We do our best to take care of ourselves, we do our best to be responsible for ourselves and our families, and we work damned hard to support ourselves and our families; we don’t have the time or the energy or the money to carry the fornicating malingerers on our backs! The vast majority of conservatives wouldn’t have any problem at all paying taxes to help people less fortunate, if they were truly just unable to support themselves. But most of us get damned pissed off knowing that the welfare system in this country is loaded up not just with people who can’t work, but with people who won’t work. We now have to look to foreign leaders to hear some common sense. Israeli Prime Minister Benjamin Netanyahu appeared on Meet the Press this morning, saying things that make sense. I’m surprised his comments weren’t cut. “I think the people who say this have set a new standard for human stupidity,” he said of those opponents. No wonder Obama doesn’t want to meet with him. The Other McCain has more. Bob Woodward made a very important observation on Meet the Press, that our intelligence information, that everyone’s intelligence information, is often not as accurate as they’d like to believe it is. The most well-known failure of intelligence was when the United States believed, wholeheartedly, that Iraq retained old, and was building new, chemical weapons in 2002, but it was hardly the only one. Mr Woodward stated that any claims that anyone knew, for certain, exactly how far along Iran was toward building nuclear weapons were foolish; their intelligence estimates might happen to be dead-on accurate, but they could also be very far off. That, of course, brings up the very old military question: do you prepare for what you believe is the worst your enemies could do, or for what you believe they are most likely to do? For Israel, a nuclear-armed Iran is an existential threat, and the answer, for most intelligent people, would be that they must prepare for the worst Iran could do; if it turns out that they overprepared, then they will have wasted time and effort and money, but their nation will endure. If they decide to base their preparations on what they think their enemies are most likely to do, and they guess wrong, the consequences could be devastating. And that is why, to Prime Minister Netanyahu, the notion that there is anything worse than an Iran armed with nuclear weapons “set(s) a new standard for human stupidity.” Armchair strategists who have the responsibility for nothing have the luxury of theorizing about what might or could or should or probably will or will not happen; the men with the actual responsibility of protecting their nations’ actual survival don’t have that luxury. As the Mohammedan, anti-Christian, anti-Israel, anti-Jewish uprisings and terror attacks greatly increase such as the multiple attacks on US embassies and consulates on the anniversary of 9/11 and the greatly expanded attacks since; and as the US, under Obama, has shown great weakness in the face of the Mohammedan terrorists and even animosity toward Israel, it is again important to note that all this stuff was prophesied. I cannot spell out the upcoming events any better than Professor Johan Malan did in March of 2011, so I’ll let him spell it out. According to Ezekiel 38 and 39, various Arab countries will attack Israel under the leadership of Russia, in an effort to bring them to their knees and wipe Israel off the map. Gog, of the land Magog, (that is modern Russia in the land north of the Caucasus Mountains) will join forces with Persia (Iran), Togarmah (Turkey), Ethiopia, Libya, and Gomer (Germany or one or other East-European nation) to invade Israel. Other nations will also join them to form a very big and formidable power. Israel’s enemies plan to obtain the participation of Russia for this big war. To Russia there is the benefit of interests in the Middle East oil fields. They would also want to prevent China from rendering military aid to the Arabs, should Russia itself refuse to do so. Although reluctantly, Russia will, according to the Bible, agree to participate in a war of annihilation against the Jewish state (Ezek. 38:4). The war of Ezekiel 38 and 39 is steadfastly approaching. The Lord will reveal Himself in a very definite and unmistakable way through preventing this war (Ezek. 38:16). The sudden supernatural destruction of the invading forces by fire is clearly mentioned (Ezek. 39:4-6). There will also be a very big earthquake in Israel (Ezek. 38:19). Russia, Israel and all the nations will recognise God because of this very clear supernatural intervention. That will bring about a major change in thinking as most of the peoples of the world, including Israel, have largely lapsed into agnosticism, materialism and humanism and consequently rejected, ignored or degraded the Triune God and His Word. Virtually all of them regard Christianity to be on an equal level with the pagan religions. In a typical postmodern fashion they view the religious statements and moral guidelines of the Bible as old-fashioned, irrelevant and obsolete. With the supernatural destruction of Israel’s enemies, the nations will acknowledge that the God of Israel and the Bible is the true God who should be feared and worshipped. That will override atheism, agnosticism and secularism. There will however be such feeble knowledge of God that they will accept the wrong person, the Antichrist, as Christ and representative of God. He will exploit the nations’ veneration for supernatural signs and, together with the false prophet, present a spectacle of signs and wonders (2 Thess. 2:9-10; Rev. 13:12-14). Humanity will accept it in reverence and awe. The signs and wonders of the Antichrist and false prophet will be so amazing, and the claim by the Antichrist that he is a descendant of King David who was sent to the world on behalf of all faiths, will sound so convincing, that even Israel will be deceived into accepting him as their promised Messiah (John 5:43). He will claim credit for the sudden termination of the threatening war in Israel, and that will overnight propel him to the position of prince of peace and unchallenged world leader. 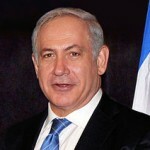 The Gentile nations will join Israel in concluding a seven-year treaty with him and recognise him as their leader. They will follow him in amazement (Rev. 13:3-4) and hail him for delivering humanity from a threatening third world war, averting a certain economic collapse, and restoring the ailing world economy and getting it back on track. Where are Israel’s allies and defenders? Who will come to her side? The obvious answer is nobody will come to Israel’s aid because all have abandoned her. But Providence, the One True God, will indeed do so in a very obvious manner. Enter the Anti-Christ and False Prophet to take the credit, and the 7-Year Tribulation begins. Look at what is happening in the Middle East, in Russia, in China, in Europe, and in the US. “Study to shew thyself approved.” End Times Prophecy will happen, and is happening right before your eyes. During the moment of silence to remember 9/11, NBC decided to interview a Kardashian instead. Muslim Brotherhood terrorists attacked the US Embassy in Egypt. And that embassy apologized to the Muslim Brotherhood terrorists for our First Amendment! Muslim Brotherhood terrorists attacked the US Consulate in Libya, killing our ambassador. MSNBC went out of its way to loudly declare its desire to have a Christian pastor charged with accessory to murder due to his non-violent exercising of his First Amendment rights, which MSNBC declared responsible for Muslim Brotherhood terrorists behaving like terrorists. Of course, Obama has decided to get tough with … Israel! By refusing to meet with the Israeli Prime Minister. While the media has very clearly coordinated their Left-wing agenda questioning of Romney over Egypt and Libya, Barack Obama refused to take any questions after reading a statement someone else prepared for him to read, as is very typical and very habitual of Obama. Of course, two people spoke out very clearly in defense of the US and our Constitution. Spot-on. It is insane — insane – that we should feel the need to tiptoe around the tender feelings of violent, overzealous radical Islamists (or, as some in the MSM now seem to be oh-so-subtly calling them, “ultraconservative” Islamists — really, guys?). Freedom of religion and freedom of speech are human rights, and I don’t mean that like ‘universal healthcare’ is supposed to be a human right (which, by the way, it isn’t). They are undeniable, inalienable, universal rights — absolutely no if’s, and’s, or but’s about it — and for representatives of the United States to get all sheepish and showcase their willingness to be bullied on that point makes me extremely nervous, to say the least. Is there any question, any question at all, why I endorsed a Palin/West Presidential ticket last year? The Obama administration is absolutely an international disgrace to our nation. NBC is disgraceful. The mainstream media with its Left-Wing agenda — not bias but agenda — is a disgrace to our nation. MSNBC, with its anti-Constitutional, Socialist agenda, is an absolute disgrace to America, to journalism, to anything representing honorable values. And if anyone holds any value whatsoever for the opinions or “journalism” coming out of MSNBC, that person is both a fool and an idiot, and cannot be considered to be a valuable contributing member to society. Within five years of ratification of this Amendment to the US Constitution, the Federal Budget shall be balanced, and shall remain in Balance thereafter, using the same Generally Accepted Accounting Principles (GAAP) mandated by the Federal Government for all Corporations. The Federal Budget Deficit must maintain an incremental and substantial annual reduction during the four years leading to Balance in the fifth year or prior. Any and all new taxes must be approved by three fifths of each Branch of Congress and signed by the President in order for passage. Any and all tax increases must be approved by three fifths of each Branch of Congress and signed by the President in order for passage. If the President vetoes any Bill containing new or increased taxes, it shall be returned to Congress whereupon each Branch of Congress must pass such Bill by two thirds vote to override the President’s veto. If the President does not sign or veto a Bill containing new or increased taxes within ten days, it shall be deemed vetoed and each House of Congress must pass such Bill by two thirds vote to override the President’s veto. In the event the Federal Budget is not in Balance, all salaries and expenses of all Federally elected officials and their staffs shall be zero until such a time as the Federal Budget is in Balance. All Federal non-military Government officials shall have their salaries reduced to zero until such a time as the Federal Budget is in Balance. In the event Congress does not pass a Federal Budget by April 15 of each year, no other Legislation shall be discussed or passed until the Federal Budget is passed. Any and all Legislation passed during the time following April 15 and preceding the passage of the Federal Budget shall be deemed null and void. That is, if you believe the notoriously partisan polling firm. And the notoriously partisan polling firm gets linked and quoted a lot, with a great many on the Left holding it as gospel. This notoriously partisan polling firm which the Left love has stated that Obama leads Romney by 5 in Ohio. Professor Jacobson has asked why Conservatives even bother talking about Progressive Party Pollers (also known as Public Policy Polling or PPP) due to their notorious shady poll weighting. My answer to that question is in the lines of “you know the Left is in trouble when even they say it”. But this is not the case. Not this time. I previously noted PPP’s heavy weighting of its polls for Democrats in stark contrast to reality. Well, they’re doing it again. The point about independents gets to the heart of the issue with this poll. The sample (pdf) has a D/R/I split of 41/37/22. The 37% that Republicans get in this survey matches their 2010 midterm turnout, which had a D/R/I of 36/37/28. The 41% for Democrats significantly exceeds that turnout, and also exceeds the 2008 election’s 39/31/30 exit polling that produced the five-point margin of Obama victory in the election. There is a reason Ohio is a multi-generational Bellwether state. It’s because Ohio tends to have three-way parity in its voter turnout. But PPP is reporting out its polling as if Ohio were a Leftist bastion. And everyone who knows Ohio like I do, having lived there for 44 years, knows Ohio is nowhere near as Democrat as PPP claims. At all. Ohio will be less Democrat this year than four years ago. You can bank on that. In 2008, Obama won Ohio by 5 points (just like this current PPP poll says he leads now). Obama also won the very large independent vote by 8 points. While PPP allows that Romney leads Independents by 2 points (a 10-point swing against Obama), PPP claims Obama maintains the same 5 point edge overall. Why? Because, while Republicans have a higher voter registration percentage today than in 2010 and Democrats have a lower voter registration percentage today than in 2008, Democrats will have 2 points more representation this election year than in 2008, despite the fact that opinion on Obama has tanked, despite the fact of the Conservative wave after wave after wave sweeping the country, despite all reality. And Independents will have 10 points fewer representation — in an Independent-heavy state — than in 2008. If Independents have indeed swung 10 points away from Obama as PPP suggests (and who can believe even that after PPP proved themselves in the tank for the Democrat position? ), then all is well in Ohio and November will see Obama lose that important state. And this time, Dana Pico will approve of this message. Coming in at tenth place is The Fort Hood Massacre victims: no Purple Hearts for them! The victims of the Fort Hood massacre are not eligible for the Purple Heart, because the attack is not considered to have been made by the enemy, or an “international terrorist attack.” The Department of Defense seemingly does not want to consider Major Nidal Malik Hasan as acting as part of the enemy, because that might bring all Muslim soldiers under suspicion of being considered the enemy. Number nine on the list with less than 1.5 percent more views than Dana’s piece is Brett Kimberlin Update: Liberty Chick Threatened with Lawsuit, originally published by Patterico in late 2010 but reprinted in its entirety here with permission from Patterico. I knew this the same night I received Kimberlin’s legal threat against me, but I didn’t want to say anything until she was ready to make it public. By the way, I received my copy of “Citizen K” in the mail today. When I return to the blog in a couple of weeks, I expect I will have read it. I am about to learn a lot more about our friend the convicted bomber. Filling in nicely at number 8, we have Big Brass Ones. Barney Frank (D – MA, retiring) has publicly declared Democrats should not have pushed forward with ObamaCare. While he’s absolutely right about that, he gets all the reasons wrong. But he’s not the only Democrat — outgoing or not — that has declared all or part of ObamaCare to have been the wrong decision to make. My version of live-blogging the West Virginia Governor Special Election Results came in Lucky Number Seven. Filling out the bottom half of the top ten at number 6, with nearly double the viewership of the 7th place article, is Barack Obama: The Most Corrupt President Ever. That article could stand for some major updating, as Obama has gone above and beyond the call of duty to add to his Chicago-style, Socialist style corruption and criminality. And now, on to the Top Five. In fifth place with a third again as many views as the Corruptocrat Obama article is The Dixiecrat Myth, prominently linked to in my sidebar. But that’s not how it got its viewership for the most part. For that, I can thank the people who write for the Breitbart group of blogs, who tweeted that it was a good piece to read — which caused a Twitter-and-Facebook explosion of linkage. First off, Liberals have to completely ignore what the Democrat Party said. “Democrats are unwavering in our support of equal opportunity for all Americans. That’s why we’ve worked to pass every one of our nation’s Civil Rights laws, and every law that protects workers.” That quote is a Democrat lie. The histo-facts bear witness to that quote being a Democrat lie. And that’s why Liberals have to completely ignore the statement in pushing the Dixiecrat myth. At number 4 is Rule 5 Political Style, which is what it sounds like. It’s a Rule 5 posting (the first in the Top Ten, but not the last) with photos of political woman, most looking — well, you’ll have to see for yourself. Now we’re to the Final Three. The Bronze Medalist is New York 9th District Election Results, another of my live-blogging a vote, and the current one-day record holder on Truth Before Dishonor. After Anthony Wiener threw his wiener around, the seat he once held — which had been held by Democrats since Prohibition but was called a difficult seat for Democrats to win by none other than that lying mouthpiece Debbie Wasserman Schultz — went Republican. The Silver Medalist is How To Get 200 Page Views A Day, which not only discusses Rule 5, but has plenty of examples of Rule 5. Emma! You’ll have to check it out to see a video from one of my all-time favorite movies. Right there for all the world to see, and in the friendly confines of the Democrat convention, was broadcast that very dangerous and Socialist/Fascist idea that we all belong to the government! And it went viral in all the wrong (for Democrats) places. Of course, Truth Before Dishonor had it. The First Street Journal picked it up. Allahpundit covered it and its aftermath, while Mary Katharine Ham showed people attending the convention loved the idea of being owned by the government or something. And some person in that video actually had the lack of self-awareness necessary to scorn the Republicans for not believing we belong to the government. There’s a word for one person owning another. That word is slavery. We had a war that decided that issue back in the mid 19th Century. Democrats were for some people owning other people back then, and Republicans were opposed to it back then. And now, here’s more proof that Democrats are still in favor of some people owning other people while Republicans are still opposed to it. As mentioned, there was some serious fall-out as a result of this video that the Democrat convention attendees were drooling over, like happy lemmings. The video in question was produced and paid for by the host committee of the city of Charlotte. It’s neither an OFA nor a DNC video, despite what the Romney campaign is claiming. It’s time for them to find a new target for their faux outrage. Mainstream media, which shills for the Democrats, weren’t covering this hubbub. So why did Barack Obama and the Democrat National Committee have to run away from it so fast? And why did they have to lay blame on a group hand-picked by Democrat power-brokers as being responsible, while the Democrat power-brokers were Pontius Pilating it away? Because they knew the severe damage it was doing to their campaign! That they didn’t know what damage it was going to do when they were putting it together tells a big enough story in itself. So, yes. The Democrat National Convention and the Democrat National Committee is indeed good for America, as they show her what they’re really about and she wakes up and realizes the mortal threat she’s under from the Democrat power-brokers. as of the end of Friday, August 31, 2012. Taking the averages, I had projected that the national debt would cross the $16 trillion threshold on Thursday, when Barack Obama was delivering his acceptance speech to the Democrite National Convention, but the President exceeded my expectations, and got it done early. Posted in Obama | Tagged: debt, deficit spending, national debt, trillion dollar deficit | Comments Off on Congratulations to President Obama!